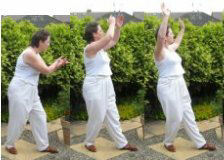 This tai chi qi gong exercise has typical bending forward and stretching up movements and is a gentle and thorough workout for back and balance. It looks like you are bending down to scoop up a handful of water and raising it to your head before fanning your arms out and down again for the next scoop. 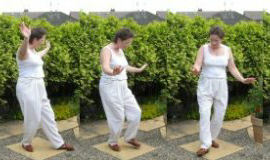 always do things slowly and comfortably – tai chi and qigong for health and relaxation are not meant to hurt! – ever!